A trend I noticed in games, which I’m none too happy about, is the general design philosophy of favoring style over substance. What I mean is with the horsepower modern gaming systems can output, developers are more interested in cramming flashy graphics and multiplayer into their games, and often that leads to shortcomings in other areas, most notably the length of the single-player experience. I then picked up the PlayStation 3 version of Red Dead Redemption, which was Gamespot’s Game of the Year last year. The story of Red Dead Redemption follows John Marston as he, upon being coerced by federal agents, pursues the gang members he used to ride with. If you want me to be ultra blunt, Red Dead Redemption is more or less a wild west mod to Grand Theft Auto. Just like in GTA, you can roam about a vast expanse and accept missions at your leisure or do whatever else you want. Even the button layout on the PS3 pad is identical to that of Grand Theft Auto IV, which came out a few years ago. Did I mention Grand Theft Auto is one of my all time favorite game franchises? Well, I more or less forgot why I loved GTA as much as I did until playing Red Dead Redemption. RDR’s real strength is how immersive the game world feels. In towns, people go about their business, and often times you are randomly approached by townspeople who need help with something; a common task is returning stolen horses to their owners. In general, the NPCs make the world feel more alive than they did in Grand Theft Auto, despite there not being as many of them; that makes perfect sense as the game takes place in a (fictional) territory in the United States that people have just begun to settle. While the meat of the game is in doing the story missions, you can very easily go off the beaten path and do other things. There are all sorts of side missions you can do, like Stranger quests. These quests play a lot like those in an Elder Scrolls game in that you can complete tasks at your own convenience and lack the general sense of urgency that normal missions have. What I found to be really enjoyable is bounty hunting. You start these by finding a wanted poster in a town and accepting the hunt. Then you go after your bounty and can either bring him in dead or alive. Obviously you can simply shoot the sucker to bring in a dead bounty, otherwise you’ll have to hogtie him with your lasso (which itself hardly gets old), throw him onto the back of your horse, then ride back to the nearest jail while loyal gang members chase you to free their brethren. Even in the wilderness, there are things to do. You can hunt animals or pick flowers in order to gain things to sell in towns to fatten your wallet. Or you can break horses to gain new mounts. This also proves necessary as circumstances often causes your horse to die, and thus you would need to find a new one. As you may expect, most of the missions involve gunplay. The gun controls are the results of the GTA games constantly refining the controls for better targeting. In RDR, you hold down the L2 trigger to aim your weapon, and usually it locks onto whoever you may be facing the general direction of, then you pull the R2 trigger to fire. While aiming, you can use the right analog stick to refine your aim for specific parts of your target, or you could break free of the lock altogether and free aim. What is interesting is Dead Eye. Dead Eye is basically bullet time. At the beginning, you can use it just for easier aiming, but eventually you unlock the ability to paint multiple targets for Marston to shoot at once. That also leads to the biggest issue I have with Red Dead Redemption: the controls. For the most part, it works, but things get problematic when you are in more confined spaces. In order to turn Marston around, you literally need to walk him in a circle, which is bad if you need to change direction quickly. Also, in Grand Theft Auto tradition, it does happen when you accidentally lock your aim onto a random schmuck far away when you meant to point your gun at the jerk filling you up with lead two feet away from you. Since you are in the open country for the most part, it’s rarely an issue, but these issues do show up. 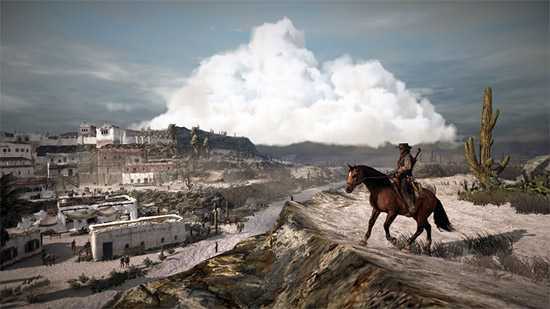 For the most part, Red Dead Redemption is a very good looking game. As you may expect, RDR does tend to sacrifice detail in character models to keep the game running smoothly with the amount of stuff that happens on-screen, but I think it’s a worthwhile trade-off. That, combined with excellent voice-acting and the general quality of the sound makes RDR worthy of being a Rockstar game with its production values. Though I do have one more gripe. Red Dead Redemption is just a tad buggy. None of the glitches make the game unplayable, but do sort of break the immersion. I have seen a cutscene where a soldier was to walk a stick of dynamite to a gate; the “soldier” was just the dynamite floating in the air as his model was never rendered for some reason. Still, Red Dead Redemption, depending on how much fast-traveling you do and how much of a completionist you are, should take you a good 20 hours to beat. For that reason, I compliment Red Dead Redemption in being the anti-Call of Duty. Rockstar decided to make one excellent game instead of churning a new one out every year, and I take my hat off to them for revitalizing their own amazing formula, much in the same way they did with Bully back in 2005.